Our final recipe for National Peanut Day is from Lovethecrunch.com. They have some wonderful ideas for recipes using crunchy vegetables like radishes. 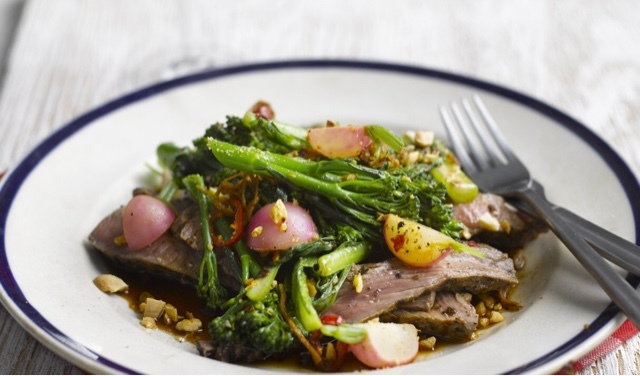 This beautiful and nutritious dish is inspired by the flavours of Asian cooking. Slice the steaks at a jaunty angle just before plating up and you will have a stunningly presented but (secretly) very simple to prepare dish to present to your guests or family. The recipe calls for Choy Sum greens. This literally means "vegetable heart" in Cantonese and can be applied to the "heart” or flowering stem of almost any vegetable including non-traditionally East Asian greens such as broccoli.